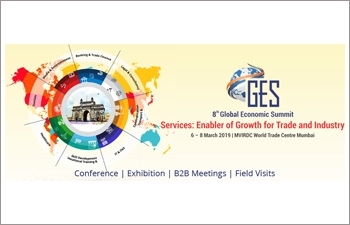 The World Trade Centre (WTC) Mumbai and All India Association of Industries (AIAI) are jointly organizing the 8th Global Economic Summit 2019 on the theme ‘Services: Enabler of Growth for Trade and Industry’, which is scheduled to be held on March 6-8, 2019 at World Trade Centre Mumbai. Mr. Suresh Prabhu, Minister of Commerce and Industry and Civil Aviation; Gen. (Dr.) V K Singh, Minister of State, Ministry for External Affairs, Government of India along with several dignitaries from India and overseas, including policymakers, international experts in multilateral organisations, multinational corporations, academicians and industry experts are expected to deliberate on enhancing Micro, Small & Medium Enterprises (MSME) competitiveness by integrating services to enhance economic and business competitiveness. The event, in which around 500 business leaders and eminent experts from across 25 countries are expected to participate, will address issues of relevance of services to enhance global trade, such as Banking & Trade Finance, Legal & Consultancy, Transport & Communication, IT, Vocational Training & Skill Development Healthcare, Tourism, Media & Entertainment, Shaping the New Global Business Landscape, Importance of Services in supporting Agriculture and Manufacturing Sectors, Smart Solutions for Smart Cities, the Fourth Industrial Revolution and its impact on Services, Impact of National Trade Policies to Enhance Competitiveness of Services Export, etc. For the participants - accommodation is available at a discounted rate in nearby five star business hotels in close vicinity to MVIRDC World Trade Centre Mumbai. Rupa Naik, Senior Director, World Trade Centre Mumbai (Phone: +91 22 6638 7378/7272, Email : marketing@wtcmumbai.org) may be contacted for any further information in this regard and submission of nominations. More updates on the event are available at http://wtcmumbai.org/.